It's a fun October project for your pumpkin unit, a science activity and a book made with brown lunch bags all in one! 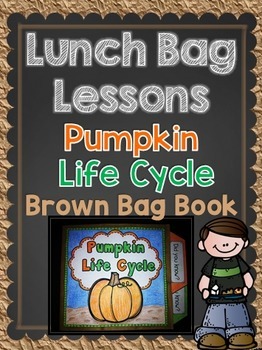 This Lunch Bag Lesson booklet is a fun way to integrate science and life cycles into your reading activities in the fall or even during a plant unit. All you need for this adorable project is a few brown lunch bags, the printables in this file, staples, crayons and glue. The design of this book allows it to be interactive! 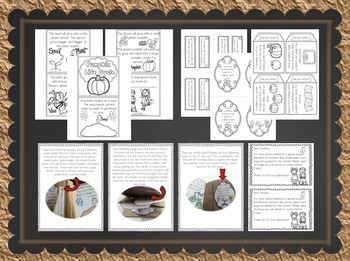 There are frames on flaps to lift to reveal a fact below and pouches with pull-out inserts with interesting pumpkin facts your students can read! The main pages of the booklet describe the stages in the life cycle of a pumpkin from seed to harvest. All pages, and the booklet cover and inserts, are created in black and white so your students can color the graphics, backgrounds and frames. This item is best suited for second grade and third grade students. First grade learners will need help with reading the text and assembling the booklet. See the thumbnail images and download the preview for a closer look. The content has been simplified and is best intended to be a supplement to your plant life cycle lessons and pumpkin unit. *As with any file that includes graphics, it is recommended that best print quality settings are used for your master copy. This will ensure the greatest clarity when copying. Thank you for stopping by to view this item! Other Lunch Bag Lesson Books are coming soon! Please follow my store if you'd like to be notified when new items and freebies become available! ** To see my class in action and to get some great free ideas and printables :) visit my Creative Lesson Cafe blog! Just click on the links below!